How do I install Factbird? How do I purchase a Factbird? If you want to purchase a Factbird, you simply contact us and we’ll help you through the process, making sure you get exactly what you need. You can either fill out a contact form or send an email to a member of our staff directly. You are also welcome to call us. You’ll find all of our contact information under “contact”. How can I log on the portal and view the data from my Factbird? If you are already Factbird user and want to access the Blackbird portal to view your production data, you can either log in on this website (you’ll find a log in button at the top right corner). Alternatively you can access the portal directly by typing app.blackbird.online in your browser. What kinds of sensors can be connected to a Factbird? Factbird can connect to both analog and digital sensors. Factbird was developed to allow the use of many types of sensors depending on customer's specifications. What kind of power supply does Factbird require? Does Factbird need to be connected to internet? No. Factbird transfers data via a GSM (Cellular network) to a cloud server. Can the user install Factbird? Or does it need to be installed by a service engineer? How do I know if I can use a Factbird for my production line? Factbird only requires a small amount of space and a power socket. It requires 3 mm distance between the objects that run on the production line to be able to sense them. How long does it take to install a Factbird? a. It normally takes less than one hour from opening the package to being able to see data at app.blackbird.online. How is the collected data secured? We use SSL encrypted connections which is the same level of security used by online banks. Factbird never sends or receives sensitive information in plain text. How many accounts can we obtain to access to app.blackbird.online? Please contact support@blackbird.online and we will reset your password. What should I do if I cannot log in app.blackbird.online with my email and password? Where can Factbird be used? 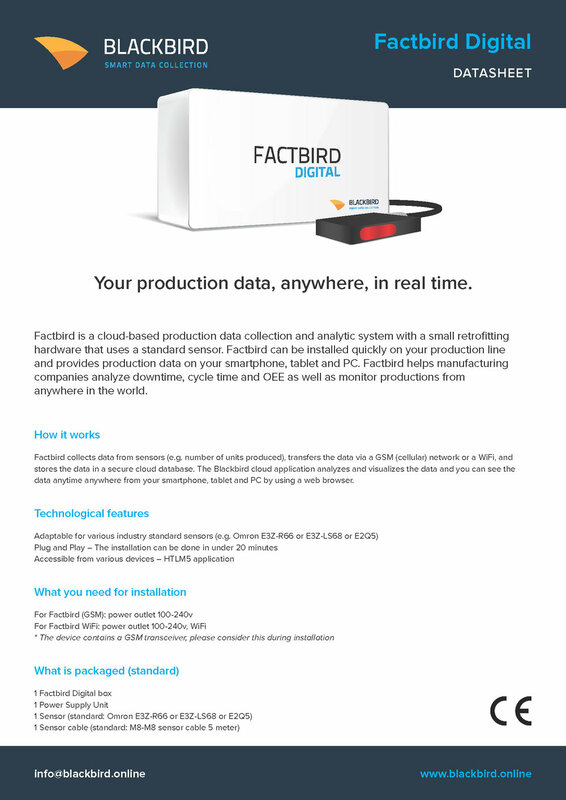 Factbird can be used at most automated production sites. It can be used at various steps within a process such as filling, during freeze-drying, capping or packaging. Please go to the Web shop by clicking “BUY ONLINE” button or Contact us. How can I buy a Factbird? It varies depending on your location. Please contact us and we will assist you with the purchasing process. What temperature range can Factbird be installed in? I want to use multiple sensors. How can I do it? One sensor connects to one Factbird. If you would like to collect data from 5 different sensors, you can install 5 Factbirds. What is the difference between a security camera and Factbird view? The video footage from Factbird View is archived minute by minute and synced with your production data. This allows you to look at the production data to see how your production is running, and if you find any abnormal situation, you can watch the video of that moment to see how that happened. How does Factbird View transfer the data to a Cloud? By using internet: WIFI or ethernet cable. How much of my video data will you store? We will store as much data as you send up to us! Storage is cheap these days and we want your data at your fingertips when you need it. We have special packages if you need extra high resolution data or any other special needs. How are the videos saved and played? The Videos are saved minute by minute in a Cloud server. You can go on www.blackbird.onlineby using your smartphones, tablets or PC and see your production graph, and then click any data point to watch the video. If I would like to install multiple Factbird View at various process points, can I get any discount?